The narcotics control bureau (NCB) has arrested a 25-year-old Brazillian woman with 106 capsules of cocaine in her stomach from Indira Gandhi international (IGI) airport. According to Vishwa Vijay, superintendent of NCB’s Delhi unit, the woman was caught on May 14 soon after she landed at the Delhi airport in a flight from Sao Paulo in Brazil based on prior information. The 106 capsules weighing around 930 grams of pure South American cocaine and worth around Rs 6 crore were extracted from her body between May 14 and 20 by administering her laxatives at the Safdarjung Hospital, NCB officials said. “This is the highest number of capsules of cocaine extracted from any professional drugs swallower by the NCB’s Delhi bureau,” said Vijay. NCB officials have refused to reveal the name of the arrested Brazilian woman. The consignment of the cocaine was to be delivered to a Nigerian national in Delhi. The woman told NCB officials that her handler in Sao Paulo had asked her to reach a hotel in Karol Bagh and stay there till further orders. “The Nigerian national, who had to accept the consignment, was supposed to meet her in the hotel. 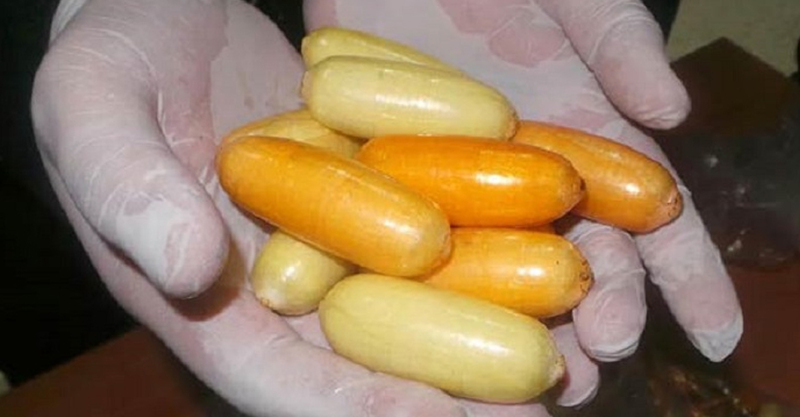 The woman was promised USD 5,000 for successfully delivering the consignment of cocaine,” said a senior NCB official. On Sunday, the woman was produced before a city court that sent her to Tihar jail. The NCB official said the Brazilian woman is a ‘professional swallower of drugs’ and had visited India at least three times in the past. “Each time, she was travelling on a tourist Visa. Her passport details have shown that her last visit to Delhi was in February this year,” said the official. During interrogation, superintendent Vijay said the woman disclosed that she was brought into the drug trafficking trade by her second husband, who is a drug dealer based in Brazil. She had separated from her first husband a few years ago. NCB officials said they have received some leads about the India-based members of this international drug syndicate. “We are putting in efforts to identify and nab them,” the official said.